Mission Centaur is a nonprofit organization that fosters public and private collaboration through Project Blue, an initiative seeking to find and capture the first image of an Earth-like planet in our neighboring star system Alpha Centauri. Mission Centaur was founded by a group of philanthropists, entrepreneurs and engineers to accelerate the study and exploration of Alpha Centauri. Project Blue is a new science initiative to capture the first photograph of a potential Earth-like planet orbiting another Sun-like star. The mission aims to launch a lightweight space telescope to directly image exoplanets around Earth’s nearest star system, Alpha Centauri A and B. With a budget the fraction of the cost of a mid-size astrophysics mission, and a planned launch by the end of the decade, this venture represents an ambitious leap forward in low-cost, high-impact space exploration. Through active collaboration between research institutions, universities, private industry and citizens, Project Blue seeks to make space exploration a participatory, collective endeavor and inspire millions worldwide to engage in scientific inquiry. Project Blue is led by a consortium of leading space, science, and research institutions dedicated to accelerating the search for potentially habitable worlds in our galaxy. The consortium was founded by BoldlyGo Institute, Mission Centaur, the SETI Institute, and the University of Massachusetts Lowell and will be steered by a Science & Technology Advisory Committee (STAC) composed of experts immersed in the excitement and challenge of taking a picture of an Earth-like planet in another star system. If you’re new to the subject, this documentary by Speculative Films is a great place to start. The film focuses on humanity’s search for habitable exoplanets around Alpha Centauri and actually features a few scientists on Mission Centaur’s scientific advisory board. It also briefly touches on our specific mission and the impact that finding an “Earth Proxima” might have. ASTRO-1 is a 1.8-meter diameter space telescope with a novel off-axis, unobscured design that delivers a wide field of view for its large digital camera. Not only will Project Blue look for Earth-like planets right in our backyard, it will be the proving ground for future missions like the ASTRO-1 space observatory, a privately-funded UV-Visible space telescope mission that will provide unprecedented views of the cosmos and alien worlds. Building on Hubble's legacy and popularity, ASTRO-1 will use advanced instrumentation and techniques and nearly double the observing efficiency of Hubble, enabling unique measurements of a broad range of celestial targets, while providing vital complementary capabilities to other ground- and space-based facilities such as the James Webb Space Telescope, ALMA, WFIRST, and TESS. 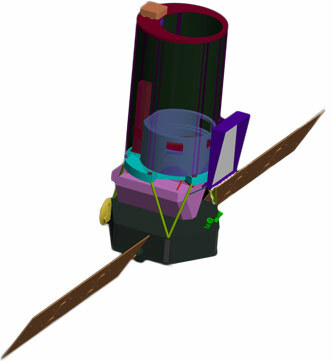 ASTRO-1 would be the path for a new generation of UV-visible space telescopes.